In the frigid north-most region of Elysium lies a castle that stands in eternal snowstorm. The Ice Citadel is one of the many unreachable places in Elysium. Its owner --- Frost Heiress --- has reigned this sparsely populated land since the conflicts between League of Angel and the demons first began. The perils of this land leaves it free from flames of war for centuries. But recently traces of demon activity disturb Frost Heiress very much. She has spent days searching for them outside with her loyal companion Bruce --- a strong polar warbear with unusually perceptible senses. Although not many people are under her reign, she still wants to protect them from any possible harm. Guess she needs some help from the experienced heroes of LOA to find those demons. Frozen Arrow (Ultimate): Shoots ice arrows towards 3 enemies with lowest HP percentage. The lower their HP percentage, the higher the damage. Fury of Frost: War Bear roars at all enemies to deal damage and reduce their DEF by 30%, plus chance to inflict Chaos, lasts 2 rounds. Piercing Ice: Launches an ice shard to pierce through enemies in a row to deal damage and reduce their Rage for 2 rounds. Heiress (Passive): As the heiress of Ice Citadel, she commands absolute respect, especially from women. The damage she deals to female enemies is increased. Ice Guardian (Awakened): Her protection of Ice Citadel is admired by all citizens, which increases her stats. Frost Heiress is a great Archer-type hero with three damage skills. Her ultimate targets 3 enemies with the lowest HP percentage and the lower the HP, the higher the damage. Her second skill deals damage to all, reduce their defense and inflict chaos on the enemies. Her third skills also deals damage and reduces rage for 2 rounds. Her skills are as useful in frontline warriors as in backline damage dealers. If you only consider her active skills, she is a great archer. But added by her passive, she is an excellent damage dealer. Her passive enables her to deal more damage to female heroes. 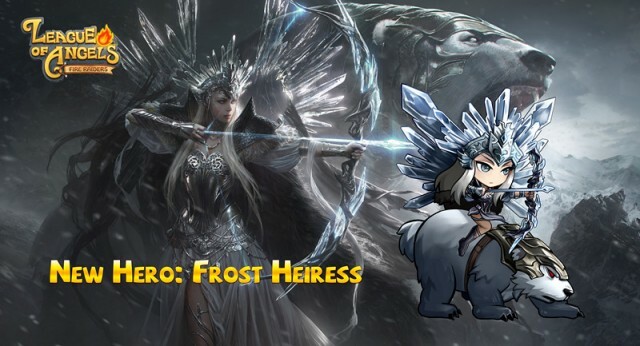 Considering there are many female heroes in game, Frost Heiress will be a hero fit for all occasions.